That was the first reaction I got from one of my Indian friends, when I told her that legalization of marijuana is a hot topic being debated in the US. 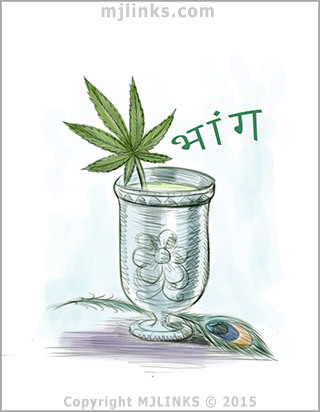 While the world debates the legalization of Marijuana, twice every year, Indians get high on bhang or more specifically bhang-thandai, bhaang-laddoo, bhaang-barfi, or some other preparation that uses Marijuana. In India the law surrounding Marijuana is nebulous and forgiving. After all, even the law cannot mess with religion. According to the Hindus, bhang was given to the world by the gods. More specifically, bhang is tied to Lord Shiva of the holy Hindu trinity, which ensures balance in the universe – Lord Brahma creates everything, Lord Vishnu protects those that need protection, and Lord Shiva destroys what’s evil and must be destroyed. In India, the use of Cannabis Sativa (locally known as ganja) in the form of bhang is widespread. Bhang is made from the leaves (and sometimes the flowers too,) and according to the Indian law the possession and consumption of ganja leaves is acceptable – perhaps because bhang bears Lord Shiva’s seal of approval, but its production is not legal. In a culture that’s more than 3500 years old, and in which the consumption of marijuana on festivals has a strong religious connotation, bhang is a household word. On Holi (the Hindu festival of colors,) in many Hindu households, men can be seen grinding bhang and preparing thandai (a concoction of milk, almonds, cardamom, a few other spices, with the paste of bhang leaves.) This is one of those rare occasions when one can see Indian men hard at something that resembles a household chore. I wrote to my Indian friend for her experiences with bhang. In India, bhang is considered to be Bholenath ka prasad (an offering to Lord Shiva or blessed by Lord Shiva,) and this is why it is also consumed on Shivaratri (the marriage anniversary of Lord Shiva.) On Shivaratri, the devotees of Lord Shiva fast the whole day and then end their fast with bhang. While all Hindus worship Lord Shiva, they worship him in his different avatars. On one extreme of the Shiva-worshipping continuum is the general populace that worships Lord Shiva and his wife Parvati as a couple and seek their blessings for marital bliss; on the other extreme are the aghoris worship Bhairav, the fiercest avatar of Shiva for his help in overcoming their fear of the dead! And yet, there’s a single thread that binds them all in their devotion – he use of marijuana. 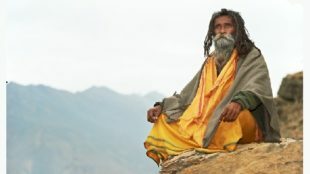 While the average Hindu man consumes it to celebrate a festival, ascetics of all kinds use it to transcend the planes of their consciousness in their attempt to become one with their chosen deity. But even in this bhang-utopia all isn’t well on the legalization front. Consumption and possession of Charas (hand-rolled Hashish) – the more concentrated resinous form of ganja was made illegal in India, in 1985. Grouping the more innocuous cannabis products with hard drugs resulted in the drug-dealers peddling higher-value, more dangerous drugs to people – thus creating a never-seen-before drug-problem in India.